We celebrate on Fridays with a fabulous luncheon. 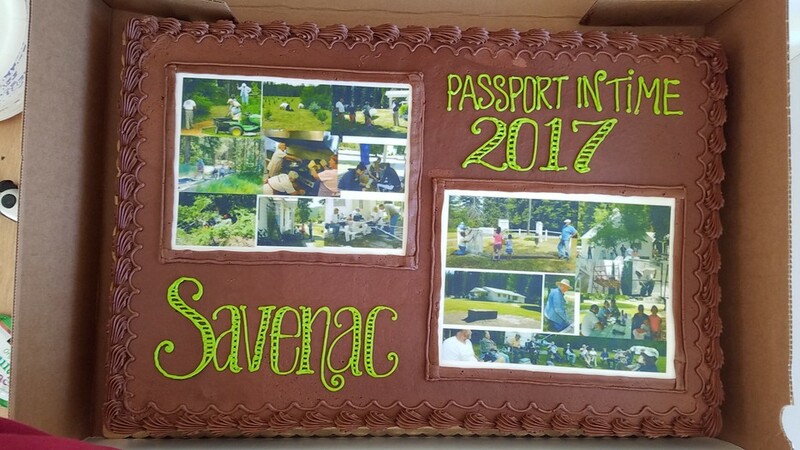 Each year we select photos from the work week to put on the cake. Maybe this year, you will be on the cake! In 1905, the then Forest Supervisor, Elers Koch, was on a honeymoon trip with his young bride when he came across an abandoned homestead, which, he discovered, was previously owned by the German settler, Savennach. He decided then and there that this was to be the location of the Region 1 tree nursery. It was ideally situated on the Mullan road, and close by were the railroads to help deliver saplings across the region. His dream was soon tested in the Great Burn of 1910, wherein millions of acres were burned and several towns were lost, including parts of Savenac Nursery. However, the Nursery was rebuilt and, within five years, had over 15 million seedlings delivered throughout the region. During the Depression-era of the 1930s, the Works Progress Administration (WPA) developed the Civilian Conservation Corps (CCC), which brought hundreds of young men out to work across the nation. Camp Taft was located just across the St. Regis River where hundreds of CCC men were employed. Their work – the buildings, bridges, trails, and even the trees that exist today – can still be seen at Savenac and, because of this association and that of the development of the early Forest Service, Savenac has been honored with placement on the National Register of Historic Places (NRHP). However, the heyday of the Nursery ended in 1969, when the nursery at Coeur d’Alene opened and Savenac closed. It was later used for multiple purposes, such as housing the Youth Adult Conservation Corps in the 1970s, but it remained mostly idle for the next 30 years. That is, until 1995, when the first Passport in Time (PIT) project began with one bucket of paint! PIT volunteers have helped maintain our buildings at Savenac since that time – no small feat by any means – and, combining your efforts with those of Forest staff, the legacy and beauty of Savenac endures. So, come on home to Savenac Nursery once again! This year will be the Nursery's 23rd PIT project! And, we have two primary goals this season: the East Cottage interior and the Bunkhouse. The District has done some heavy cleaning in the East Cottage, but we need some help building and repairing windows, screens, a storm door, and building new beds to get it ready for the Cabin Rental Program. We would like to build new bunkbeds for the upstairs portion of the bunkhouse, and fix that east side porch. Our grounds crews will be maintaining the current interpretive trail (putting wood chips and rails in place), with the gardening crew pruning lilacs, iris's, and so on, along with other duties that will finally pop up during the spring thaw. We will have continued work on the walkway stones and in the Christmas tree plantation maintenance area. Also, anyone handy with a post-hole digger, this year could be your dream year at Savenac: we are looking at installing / moving interpretative signs to help guide people around the compound! As July nears, we will have more projects in the queue, but we can count on these listed for starters. And, as always, we need your help to keep this site at its best! If you are new to PIT, this is the deluxe of PIT projects. We have many volunteers who have returned year after year. We have seen many young families come in and grow up with us, then bring their own kids with them. Under adult supervision, we have helped our youth gain skills in carpentry, trail maintenance, and just good, old-fashion hard work. And, at the end of each project, we all get to see our accomplishments and have a small celebration remembering and honoring a number of people who have brought us to where we are today. We need your help to keep this site at its best, so join us again this summer! Special skills: Previous construction, carpentry, painting, general grounds-keeping, landscaping, and/or restoration skills helpful, but not required – if we ever get a plumber out here, he or she will become a local hero!